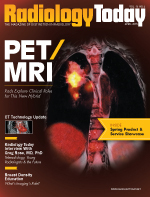 One constant involving CT to come out of December's RSNA 2014 is that the original equipment manufacturers continue to make specific technological developments enabling customers to better manage patient care, including lung cancer screening, dose guidance and regulation, spectral and multi-energy imaging, and expansion of cardiac and brain imaging. The majority of the buzz at RSNA surrounded two topics: CT for lung cancer screening and multi-energy exams. Not surprisingly, these are areas in which companies have focused their new products. Here's a look at 2015's new offerings in the United States from the leading manufacturers. In November 2014, Philips received 510(k) clearance from the FDA for the IQon Spectral CT, multi-energy technology that adds the capability to collect anatomical information and to characterize structures based on their material content within a single scan. Danielle McCann, senior product manager of global CT at Philips Healthcare, says its customers seek the most efficient and effective way to achieve the best patient care at the lowest cost. "This is a challenge as the volume of imaging data has grown exponentially and the implementation of effective workflow practices has become more difficult," McCann says. "Our newest CT innovation, the IQon Spectral CT, is an answer to these challenges our customers face. The unique spectral capabilities of the IQon Spectral CT give clinicians the ability to be recognized as clinical leaders, and at the same time, low-dose champions." With the IQon Spectral CT users can obtain conventional anatomical CT images at the standard energy level, plus on-demand spectral results—including color quantification, the capability to characterize of structures based on material content—in an all-in-one scan. Users can scan patients as normal and the spectral information is automatically available. "No one can argue that advances in multi-energy CT are exciting and promise new ways to analyze information to speed up time to diagnosis. Yet legacy dual-energy approaches come with compromises in image quality, dose penalties, and workflow," McCann says. "Philips is positioned to fulfill the true promise of multi-energy imaging with the IQon Spectral CT—the world's first spectral detector-based CT."
Dominic Siewko, radiation health and safety officer at Philips Healthcare notes customers are asking for more control over the radiation dose they give to their patients. "Imaging devices do not effectively communicate with each other for the purposes of sharing patient dose data and exam histories," Siewko says. "Having tools that are able to gather, combine, analyze, and display CT dosimetry data as well as system protocols is a great advancement in the space of improving quality within radiology departments. You cannot improve what you cannot measure and this is the first step in standardizing and normalizing radiation dose to patients across CT protocols as well as other modalities." GE recently released a new family of four scanners: the Revolution CT, the Revolution EVO, the Revolution GSI, and the Revolution HD. "All of them are built on a common core technology that's really focused to deliver on four key benefits: diagnostic confidence, clinical excellence, patient care, and financial performance," says Henry Hummel, GE's president and CEO of molecular imaging and CT. "Each scanner is really focused on helping clinicians redefine what's possible in CT. When you think about Revolution CT, it's really the combination of wide coverage, high spatial resolution, and high temporal resolution—really providing a unique combination in the industry." GE's first Revolution CT has been in operation at Miami's West Kendall Baptist Hospital since September 2014. It offers 160 mm of anatomical coverage in a single rotation, 0.23 mm spatial resolution, built-in metal artifact reduction, and fast temporal resolution enabled by 0.28-second rotation speed combined with intelligent motion correction for one-beat, motion-free cardiac scanning at any heart rate. The broad anatomical coverage covers whole organs, enabling 4D imaging for all anatomies to visualize vascular flow, organ motion, or kinetic properties. Hummel adds that CT is gaining more acceptance as a planning tool for sizing and planning for aortic valve replacement procedures and use of the Revolution CT has reduced scanning time and dose significantly. When GE speaks with customers, they find that in addition to dose management, consumers are looking for tools to help them improve their diagnostic competency especially for exams such as cardiac CT angiography. Another thing that they're looking for is help around protocols. "We've put programs in place and we've got a Web application to assist our customers in helping them understand the standards and also to check compliance on their systems and to be able to download certificates of compliance for their records," Hummel says. "It's really making sure they've got good visibility, good understanding, and peace of mind as they have to make decisions around how to meet those requirements." Going back one year to RSNA 2013, Siemens Healthcare introduced a new high-end scanner, the Somatom Force, a dual-source CT that significantly lowered radiation dose. For that platform, Siemens upgraded the X-ray tubes and the detectors in the system to allow for significant expansion in the use of lower kVs. At RSNA 2014, the company introduced twin beam dual energy. "Siemens has long been the pioneer in dual-energy imaging thanks to our dual-source CT platforms where you're able to use one tube at one energy, a second tube at another energy, and do a simultaneous dual-energy acquisition," says Matthew Dedman, CT product manager with Siemens Healthcare. "That allows us to do this dual-energy acquisition on a dual-source platform with no additional dose, so there's no dose penalty to the patient. That's really the gold standard. From the same single CT scan being able to get this increased amount of information thanks to the dual-energy technology and doing that all without an increased dose to the patient." With this gold standard in mind, Dedman says, Siemens developed this new twin beam dual-energy technology, which now enables one to do a simultaneous dual-energy acquisition on a single source, more of a traditional, one detector CT scanner. "We're now able to bring those benefits that have been well-known in dual-energy CT from our dual-source platform down to a single-source platform that's more widely available in the market," Dedman says. "That's available on our Definition Edge and Definition AS+ systems. This was really the highlight of this past year's RSNA, this introduction of the twin-beam, dual-energy technology." Satrajit Misra, senior director of Toshiba's CT business unit, notes the biggest issue that the company hears from customers involves dual standardization and standardization of protocols. "Even if you have multiple CTs from the same vendor and they're installed at different locations, you could have situations where a patient goes from one facility to another facility and gets scanned on the same type of machine and get completely different diagnosis," Misra says. "When you deal with large IDNs [integrated delivery networks] and you see a lot of consolidation going on and all this to become part of big, integrated networks. This is one of the big concerns they have as to how do they standardize their care across all their facilities. It's a pretty significant challenge." Misra believes finding a way to come to terms with standardizing acquisition protocols and standardizing the viewing protocols—and, by extension, standardizing the quality of care across multiple facilities—will be one focus for many manufacturers over the next several years. Toshiba introduced a few innovations at RSNA, including a new detector technology that's being rolled out across its entire portfolio. "What Toshiba does, philosophically, is every time we innovate we don't just put our latest innovation on the super scanners; we basically take that innovation and put it on all of our scanners from the entry level 16- and 32-slice scanners all the way to 640 slices," Misra says. "What this new detector does is it basically gives you more light output so basically increases the efficiency of your detecting chain significantly. So it gives 40% more light output. We've improved the electronics and we've improved the ergonomics of the system. We've improved the design of the scintillators and all of that." The company is also in the process of rolling out an entirely new operating environment designed to drive protocol standardization across all Toshiba scanners. "Slightly before RSNA, we announced a scalable superpremium system. You could take our highest-level scanner and scale it down to a midrange scanner, so you could start at a 320-slice scanner and then go all the way up to the 640 version through simple field upgrades, with very little downtime," Misra says. "That's another big thing that is creating a lot of buzz in the market because many customers don't have the budget to buy a superpremium system yet but as their practice grows they'd like to have access to one. By building the scalable system on the premium end we have given them a very nice solution to start with a lower budget and build up as their practice grows." David Webster, vice president of global sales and marketing for NeuroLogica, says Samsung acquired NeuroLogica in 2013 because of its position in the portable, alternative CT space. "We brought to the table the ability to build CT but in a niche market. So, our initial product, the inSPira HD SPECT, a brain CT scanner, is widely used in neuro ICUs around the world, where it's difficult to transport or treat patients," Webster says. "We introduced next the BodyTom, which is a full body, large or 32-slice CT, which started out with neurosurgery and spine surgery, and now we're expanding the indications into things like radiation oncology, trauma, and anywhere where a clinician would like to make improvements in care by having this CT in a space." NeuroLogica recently worked with Cleveland Clinic on its Mobile Stroke Treatment Unit, an emergency response vehicle equipped with highly specialized staff, medications, and equipment, with its portable NeuroLogica CereTom CT scanner, designed to get stroke patients potentially life-saving care faster by bringing treatment to them. Hitachi offers 128-slice and 64-slice versions of its SCENARIA system in the United States. The SCENARIA line is designed to deliver dose efficiencies, superb image quality, and enhanced workflow to suit a range of radiology and cardiology imaging environments, according to the company's website. The company also offers its ECLOS16 system. The 16-slice system is suited for imaging centers and community hospitals not providing cardiac CT services, according to Hitachi. Offered with lease and purchase options, the system is designed to offer low siting and service costs for the lowest 16-slice total cost of ownership, according to the company. Pressures in the health care industry will continue to force customers to find the most efficient way to provide the best patient care at the lowest cost. Future CT innovations will need to address these challenges and unlock new pathways to patient-centric care. McCann sees advancement in multi-energy imaging application providing clinicians more information about a region of interest or incidental findings. Further down the road, she says, retrospective photon-counting will provide clinicians even more information to make a quicker, more definitive diagnosis. Misra believes that CT will move toward doing more functional imaging in addition to morphologic imaging. He sees dual standardization and protocol standardization as other significant trends. "Today, CT is basically used to look at the presence of lesions and shapes of lesions and sizes of lesions and all that," Misra says. "But what we are seeing is that a lot of CT is now moving towards looking at function or physiologic," he says. "You've got to have more and more physiologic capabilities in CT and more and more procedures done that involve physiologic CT."
Webster says there's a lot of discussion about the overutilization of CT, but at the end of the day CT is one of the key modalities that doctors use in examining diagnoses and checking out patients. "It's fast, and it provides the best quality image," Webster says. "So, all companies are looking for ways to improve image quality while lowering dose and they will continue to do that in the future."